Hello earthlings! I am so sorry it has been so long since I cooked you any food! I hope you aren't starving! Life has been very busy and though it doesn't seem to be letting up, I like it this way! I will however, be posting a little more often after next week. I realize some people only post once or twice a week but, that is hard for me, I like posting more often if possible. Pastina.....literally means "little pasta". This can be made with ANY little pasta you want. One of my friends uses star pasta, it was always "pastina" in her house growing up. You can use anything as long as it is little. I will be using orzo in this recipe. I am going to go against everything I believe in and say you could probably substitute whole wheat pasta nicely in this recipe. However, IF you tell anyone I said that, I will deny it. Anyway, this dish can serve as a side or a light lunch or supper. It is as flexible as my last yoga instructor and there is nothing you can't do with it! My recipe is just how I make it, I am sure you might want it with carrots, or lima beans....oh no, please don't use lima beans. Blech! I would definitely keep the ham but you can use whatever ham you like. I use deli shaved ham and then just chunk it up. This recipe was given to me by an older Italian woman I worked with (Mrs Garbarino) and she told me in her family this is the first solid food all babies eat! She never gave me a recipe just said, "the ingredients are in the name Chris". I figured it out and when I used to watch my great niece Miya, it was her very favorite. She was almost 2 and I let her help me make it. She would stir and stir! It just reaffirms my belief that if you let kids help you cook they are far more likely to eat it!! Even little ones! Sadly I don't see my little "Mio Miya" to often anymore so this one comes with a cup of happy memories and the happy thought of hearing "Cwissy" in the near future! This dish is easy peasy, (I crack myself up) and I hope that you and your family enjoy it as much as Miya and I did together! 3/4 cup ham chopped fine or in strips. I use deli ham. In a saucepan bring your stock and water to a boil. I use bouillon cubes for this since they are cheap and the broth will be drained anyway. For this reason I do not have salt in the ingredients. Boil pasta according to package directions and drain. Put back into your hot pot! Add in peas, ham, butter, and grate in your Parmesan. Give it a good stir and serve warm! See how easy!?!!? Enjoy a great evening with your kids, your pets, whoever makes you happy!! *SIGH* Wish I was a next door neighbor that you liked! I definitely need some comfort food right now!!! I like that idea.I'm half Italian and I fed my little ones pastina with cheese all the time. 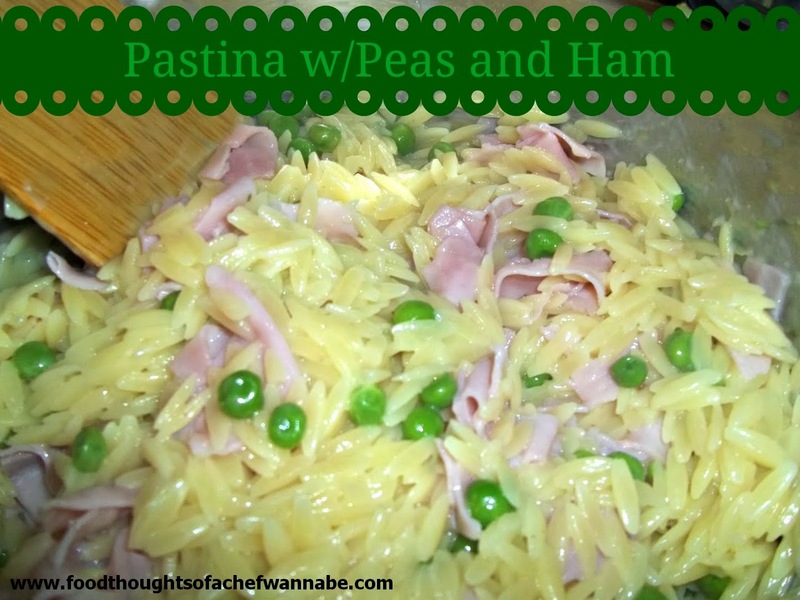 Never added peas or ham just pasta, a bit of milk and cheese. Fond memories! I would give them a spoon and eat some too! Babies, teens and grown ups like it! Thanks for the memories :)p. s. My all time favorite is peas n sauce with grated cheese..yummy! Love pastina and peas. My munchkin loves it too. I love the use of deli ham, so easy and a nice blend of Italian American! Thanks for sharing.